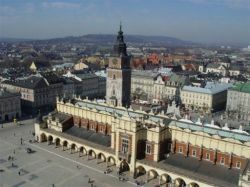 Krakow-Prague - Pearls of Central Europe, 2018 - 2019 tours to Poland - discover exciting Poland with us! Your arrival in Cracow, transfer to a centrally located hotel. Time to relax and an overnight stay at a hotel. Breakfast, guided tour of Cracow: the Main Market Square, St. Marys Basilica and historical trade pavilions of the Cloth Hall, the Royal Route, Collegium Maius, Wawel Hill with its renaissance Royal Castle and Cathedral; a walk round the Old Jewish Quarter - Kazimierz. Dinner in a regional restaurant with live folk music, overnight stay at a hotel. Breakfast, transfer to the Cracow train station and departure by express train to Prague, where you will be welcomed by our driver. Transfer to a centrally located hotel. Time to relax and an overnight at a hotel. Breakfast, and half-day tour of Prague, with English speaking guide. You will visit the Old Town, the New Town and the Little Quarter including a 70 minute excursion of the Prague Castle with entry to the St. Vitus Cathedral. The tour includes a visit to the area of the Prague Castle and the ancient Jewish Quarter Josefov (from the outside). The tour ends at the top of the Old Town Square Tower with a fantastic view of the city. Afternoon time for a private walks, gift shopping. An overnight stay at a hotel. Breakfast, and whole day tour to Karlovy Vary, the world-famous spa, founded in 1358 by Charles IV. After a 2 hour drive west from Prague, you stop at the Moser glass factory, where you can read about the history of Moser and view (or purchase) the wonderful objects they make. On arrival at the Old City Center, lunch in the restaurant of hotel Termal. Afterwards you will have time for a walk around the city. You will come to Prague later that day. Time to relax and firewall walk. An overnight stay at a hotel. Breakfast, transfer to the Prague airport or train station. Departure. Tour dates: any between March 1st and October 31st of 2018 on your request. Price: 1290 $ / person - NOW USD 1190 / PERSON ! - single bed room with extra fee, on request.